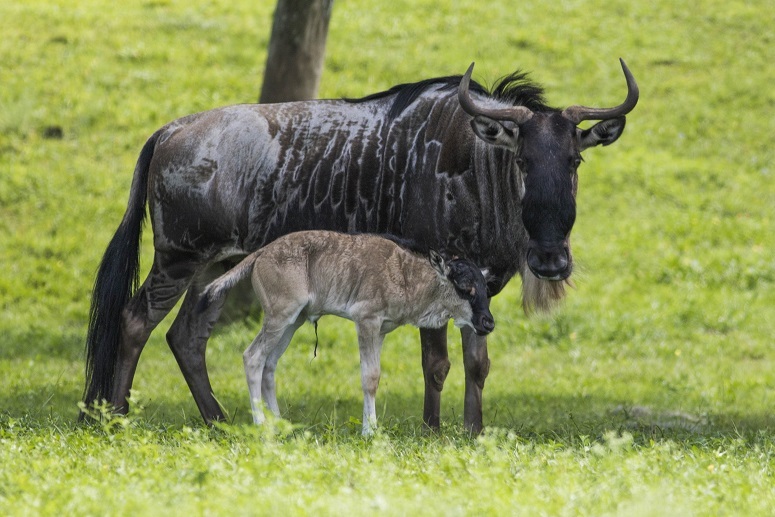 Busch Gardens Tampa recently welcomed a baby white-bearded wildebeest to the more than 12,000 animals that call the park home. The male calf was born on July 7 on Busch Gardens’ Serengeti Plain and weighed approximately 40 pounds. The gestation period for wildebeest is between 8-9 months, and calves can stand and run within 3-7 minutes after birth. Additionally, calves will nurse for most of the first year and will follow their mothers as they move with the herd. White-bearded wildebeest are native to Kenya and Tanzania in eastern Africa, and adults can weigh as much as 600 pounds for males and 500 pounds for females. Busch Gardens’ guests can see the baby, along with the rest of the wildebeest herd, by booking a Serengeti Safari (extra fee required) or by taking a ride on the Serengeti Express Railway.